Do you need weather data for a project/research? If so, please read on. From time to time I receive requests for UK weather data from users for a variety of purposes. The three main purposes tend to be those relating to (1) academic research, (2) school project work, and (3) research of a commercial nature. Data from the Climatological Observers Link (COL) (mostly monthly values, but I can put you in contact with local observers for more detailed (daily) observations). Click here for a small subset of what is available each month. Data from my own archives of 6-hourly decoded synoptic reports - data from this can be viewed here and can be see in an 'English language format' here. I am able to give away small amounts of such data at no charge for any bona-fide research but may make a charge for commercial requests. The location of most COL stations can be seen here. However, such data are limited in their scope. COL data goes back about 40 years with about 300 stations reporting per year in recent years. 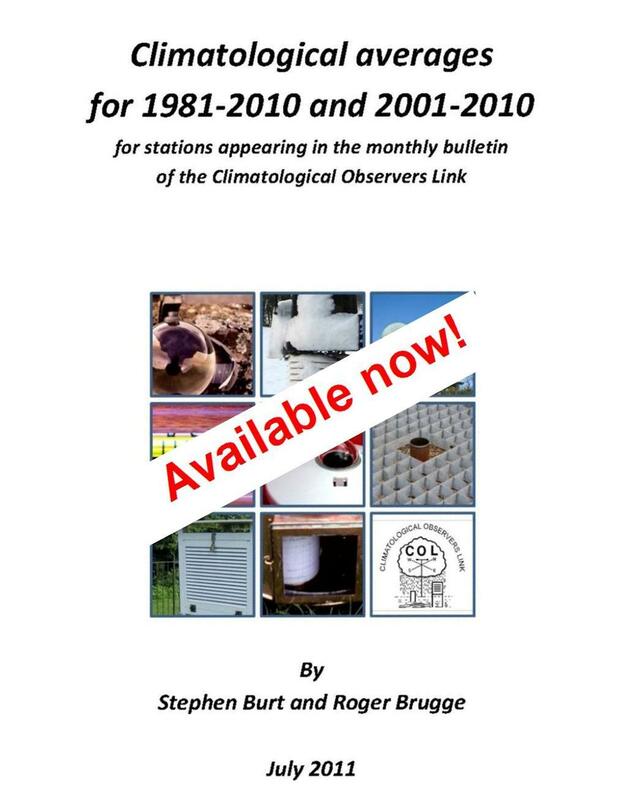 The synoptic reports go back to about 2007 and cover about 150 stations - with some gaps. Another source of data is the British Atmospheric Data Centre (BADC), who hold an extensive archive of UK surface observations from the Met Office. As these are Met Office datasets they are available - for free - to any academic research - i.e. they don't have to be UK based or University-NERC funded. The key thing is that it isn't commercial or for private use, and ideally BADC would like users to be publishing their results in openly available literature (usually peer reviewed journals but theses are also acceptable). There are two main datasets that probably contain what many people need for their studies. 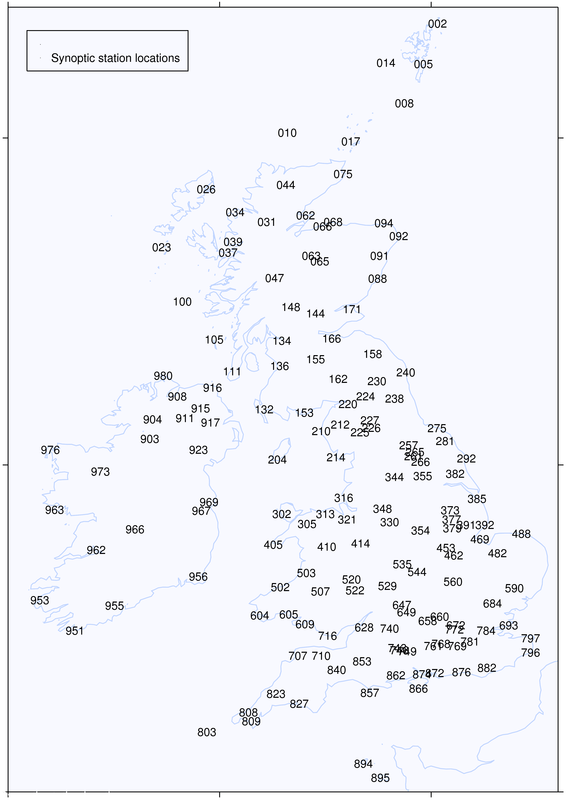 The first of these is the Met Office MIDAS Land Surface Station dataset. 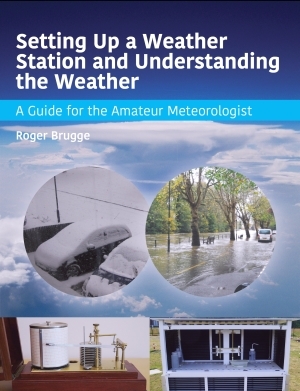 This contains data from meteorological stations mainly in the UK, but also for global stations too. Some station records go back to 19th Century, but coverage varies enormously. The best thing for users to do is to use the MIDAS station search features that have been put together to examine what stations are available for a given time period for a particular message type - see here. The second of these datasets is the Met Office MetDB dataset. As BADC's MIDAS holdings are subject to delays of around a month or so before getting to the BADC and have limited scope (just surface meteorological observations) BADC have a dataset that gets updated much more frequently and closer to real time to accompany the MIDAS data holdings. The MetDB dataset contains around 9 message types - land and ship SYNOP messages, metars reports, amdars, TEMP and PILOT messages, RASS and windprofiler, ozone sat and ozone profiler and climat reports. 5 of these are converted into a proper archive format at present and BADC hope to have the others into a better format in the near future. Most messages are updated upto 4 times daily and BADC release the data around about 3 days in arrears. To help users make the most of the dataset BADC have put together a series of "web-guides" that take people through the various stages of how to locate a suitable station and then how to extract the data and read into programmes such as MS-Excel. Please mention that you found out about BADC via these pages. Note that a registration form has to be completed before data can be released by BADC. From personal experience, most users will be interested in observations of quantities such as daily maximum/minimum temperatures, rainfall, sunshine, air pressure and wind speed. When making any request to myself, please be as specific as possible. Mention the period that the data should cover, the station(s) for which the data are required, whether extreme (eg. daily high and low) values, climatological averages or continuous data (i.e. every 6 hours) are needed. All too often I get requests along the lines of "Can I have temperature data for London?..." Regardless of the source of the data that you use, due credit should be given to the source of the data in any report or publication that may result.